Countdown offers will urge your customers to check out in a limited time. Add this item to cart to see how it works on a site. Skyrocket checkout rate with Countdown Timer offers. Increase average order value with Sales Motivator. Prevent cart abandonment and boost checkout rate with Exit Popup. How to create a countdown offer like that? Let follow my instruction here: In Offers tab >> Click Add offer. The next screen will show you the list of types of offers that Checkout Boost can create. Because we need to create a Countdown offer at the moment, hence you must choose Countdown offer. Step 1: Choose what you would like to offer your customers. Shopify Checkout API makes it possible to purchase products from a Shopify store programmatically. You can use Checkout API to manage the jobs relevant to calculating taxes, shipping rates, attaching the customer's information, and eventually completing a purchase activity by submitting a payment. For more information about Shopify Checkout API, you can read here. In this case, it is required to finish code installation as our instruction here. Whenever you offer a free gift, there will be free gift variant generated accordingly. The code work is required in order to hide this variant on your storefront, however, please do not delete free gift variant in your store backend. If you find it hard to play with code, simply invite us (hi@beeketing.com) to your store admin so we can help you do it for FREE. Moreover, If you select cart discount or free shipping, you will need to create a coupon code in shop admin and submit that code while creating your offers. The app can not generate such codes for you. - Cart discount: customers will get a monetary/percentage discount code. Remember to generate this code in your store backend. - Free gift: any items in your store can be offered and they can be the items which you would like to sell out. You can offer multi-items to give different choices for customers. - Free shipping: a free shipping code will be shown on your offer. Remember to generate this code in your store backend. Step 2: Edit your offer's information. The subject should be a hook to catch customers' attention. Eg: Special offer for lucky customers like you / A little surprise just for you! Urging customers is a good message. E.g: Only 5 minutes left! / Get this great deal right now! - Countdown clock will show the real time as you set up. Step 3: Set rules to show your offer. 3.1. Where do you want to show the offer? - You should select option 2 (Cart page) or 3 (Exit Intent) with this kind of offer. - If you select Exit Intent, please make sure that the offer's incentive is more valuable than other pre-purchase offer (if any). 3.2. Set up offer's conditions. - Product: you can add multi-item or multi-collection in condition. - Product price: a progress bar will appear to motivate your customers to add more items to cart to reach the goal. If you want to apply your offer to all orders, set the goal at zero and the progress bar will not show for this offer. Step 4: Everything is ready? Click "Add offer" button and see how it works on your store. The Countdown clock offer will pop out and the clock will count the real time as you set. If you don't complete the discount within the limited time or close the popup, you will be redirected to cart page. If you close the popup, the countdown offer will be minimized to a clock at the bottom right corner and still continues to count the time. 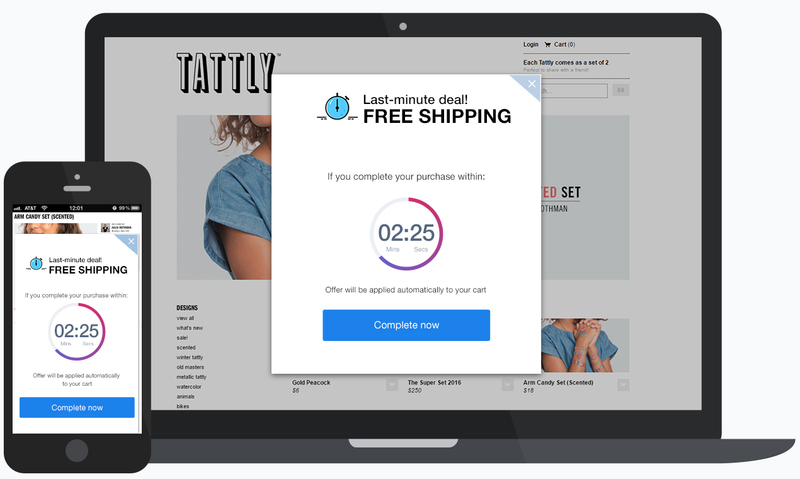 If the customer checks out before the time run out by clicking the mini clock and its checkout button, they can still get your offer.